A fundamental and widely-applied paradigm due to Franklin and Yung (STOC 1992) on Shamir-secret-sharing based general n-player MPC shows how one may trade the adversary threshold t against amortized communication complexity, by using a so-called packed version of Shamir’s scheme. For e.g. the BGW-protocol (with active security), this trade-off means that if \(t + 2k -2 < n/3\), then k parallel evaluations of the same arithmetic circuit on different inputs can be performed at the overall cost corresponding to a single BGW-execution. 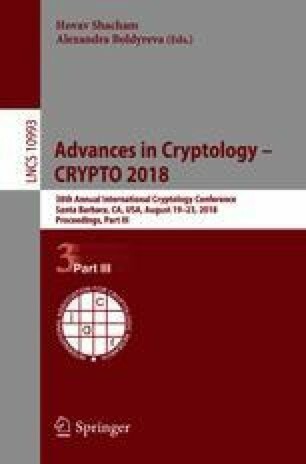 In this paper we propose a novel paradigm for amortized MPC that offers a different trade-off, namely with the size of the field of the circuit which is securely computed, instead of the adversary threshold. Thus, unlike the Franklin-Yung paradigm, this leaves the adversary threshold unchanged. Therefore, for instance, this paradigm may yield constructions enjoying the maximal adversary threshold \(\lfloor (n-1)/3 \rfloor \) in the BGW-model (secure channels, perfect security, active adversary, synchronous communication). Our idea is to compile an MPC for a circuit over an extension field to a parallel MPC of the same circuit but with inputs defined over its base field and with the same adversary threshold. Key technical handles are our notion of reverse multiplication-friendly embeddings (RMFE) and our proof, by algebraic-geometric means, that these are constant-rate, as well as efficient auxiliary protocols for creating “subspace-randomness” with good amortized complexity. In the BGW-model, we show that the latter can be constructed by combining our tensored-up linear secret sharing with protocols based on hyper-invertible matrices á la Beerliova-Hirt (or variations thereof). Along the way, we suggest alternatives for hyper-invertible matrices with the same functionality but which can be defined over a large enough constant size field, which we believe is of independent interest. As a demonstration of the merits of the novel paradigm, we show that, in the BGW-model and with an optimal adversary threshold \(\lfloor (n-1)/3 \rfloor \), it is possible to securely compute a binary circuit with amortized complexity O(n) of bits per gate per instance. Known results would give \(n \log n\) bits instead. By combining our result with the Franklin-Yung paradigm, and assuming a sub-optimal adversary (i.e., an arbitrarily small \(\epsilon >0\) fraction below 1/3), this is improved to O(1) bits instead of O(n). The work of Ronald Cramer and Chen Yuan was supported in part by ERC Advanced Grant No. 74079 (ALGSTRONGCRYPTO). Part of Chen Yuan’s work was performed while he was employed at NTU in Singapore. The authors thank Martin Hirt, Ivan Damgård, Yuval Ishai, and Jesper Buus Nielsen for helpful discussions and the anonymous reviewers for their valuable comments.